We express our solidarity with students at Warwick University who have just released a statement confirming that they have occupied the Council Chamber in protest of the marketization of the public university. An excerpt from the statement is below; the statement can be read in full here. They can be contacted at PPUWarwick on Facebook or warwickagainstprivatization@gmail.com. While fees climb to £9,000 a year, bursaries are either cancelled or transferred to ‘fee waivers’; meanwhile, in universities like Warwick, maintenance costs are driven up by the construction of ever-more expensive accommodation. The vast post-university debt (£43,500) now facing less privileged students whose families cannot afford to pay up-front makes university education seem both risky and undesirable for many. This process is changing the perception of higher education from a public good to a private investment, from a communal right to an individual privilege, accessible only by the few, as demonstrated by falling applications from disadvantaged backgrounds. The widening gap in pay between senior managers and frontline staff, and the debt forced on students, means that the university now reproduces social inequalities rather than contesting them. This undermines the university’s democratic function as a space in which free thought, debate and critical inquiry is fostered in order to give people the tools to challenge social hierarchies and play an active role in the public sphere. Our opposition to the rising salary of the Vice-Chancellor speaks to a deeper opposition to the continuing marketization and privatization of higher education. The problems at Warwick University are problems for the entire university system under market logic. The management of this university is failing to make the case for the protection and promotion of the public university, so we must do it. The government’s radical restructuring of higher education has crept up on us, and we must act now if we are to resist – before it’s too late. As the benefit caps begin to be implemented in London, we want to share with you this important new report by researchers at Sheffield Hallam University. It documents how the financial impact of the UK government’s cuts will vary widely across the country, hitting Britain’s poorest places the hardest, and allowing more affluent areas “to escape relatively lightly”. The findings of the report illustrate class warfare in action – how neoliberal policies for economic “recovery” put the burden of “austerity” on the backs of the poorest and most vulnerable. So although Margaret Thatcher will be buried tomorrow at a cost of £10M to the UK taxpayer, her oppressive classist ideology can be seen to live on in the policies of the current government. No to Welfare Reform! Stop the Cuts! 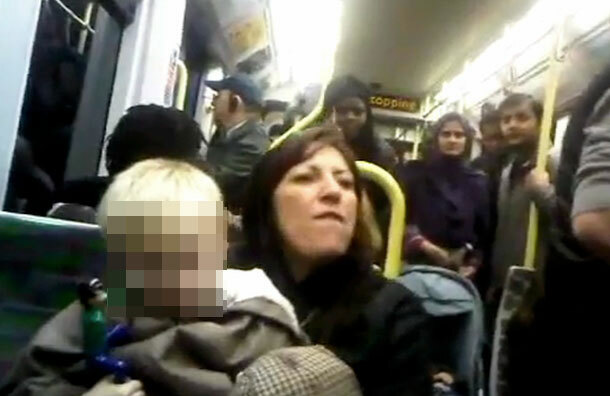 “You are doing racism wrong” – I think this has been the overwhelming British response to #MyTramExperience which was uploaded to Youtube this week. We denounced this woman emphatically; Croydon MP Gavin Barwell told The Voice “Frankly it is people like this woman that the country would be better off without” and journalist Piers Morgan tweeted that the woman should be deported, (what is with this archaic British territorialism?) The reality is the protesting was far more concerned about maintaining the British culture of – well, lets call it diplomacy shall we – than an allegiance to anti-racism. Emma West was arrested. Order was restored. And we have congratulated ourselves on how civilised we are about these things. Might I remind you it is only just over forty years since Conservative MP Enoch Powell, (a member of the gang governing us now), gave his ‘River of Blood’ speech, in which he addressed the nation with the exact same message as the Croydon perpetrator above. The same year as the 1968 Immigration Act which essentially made this racism a part of government policy. Racism plays a more prominent role in our society than many of us are willing to accept. The relentless commitment to the personification of racism – that is, conceptualising racism as a single person/action – makes it almost impossible to recognise the complex ways it informs our social reality. We – or you really – are apathetic about race/ism in this country. ‘My Tram Experience’ was trending worldwide. However when there were successive revelations of fraudulence and belligerence in the Mark Duggan case – the man whose murder was the catalyst of rioting across the country this summer – metropolitan police corruption was not trending. I have not witnessed the same level of national outrage at the unjustifiable deaths of Black men in police custody; or that over the last six years in Haringey, for the 10300 job seekers there have been 352 vacancies1. People lets get serious. I am not impressed that we arrested a woman with visibly poor mental health for her racist ranting. This is all a part of state performance. Emma West was not doing racism right. Our government agencies have shown us there are more efficient and quite frankly less noisy ways of denigrating Black and Ethnic Minority citizens in Britain. Underemployment, housing overcrowding and incarceration have all been working fine so far. Perhaps we would turn our attention to these areas if we were not so caught up in racism through drama.